IN April 1919, the city of Limerick was the stage for a dramatic confrontation between British rule in Ireland and the organised working class. It was the first such major clash since the establishment of Dáil Éireann the previous January. The events which led to what became known as the Limerick Soviet centred on the rescue of a republican prisoner from the Limerick Workhouse Hospital. Bobby Byrnes was Adjutant of the 2nd Battalion of the IRA’s Limerick Brigade. He was also a member of the Trades and Labour Council. Victimised because of his politics, he was dismissed from his job as a telegrapher. Arrested in January for possession of a weapon, Byrnes was sentenced to a year’s hard labour and led the republican prisoners in Limerick Prison resisting criminalisation. They smashed up their cells, were attacked by the RIC and then embarked on a hunger strike. After three weeks on the strike, Byrnes was moved to the Workhouse (or ‘Union’) Hospital where he was kept in a public ward but under armed RIC guard. On 6 April, 24 IRA Volunteers mobilised to rescue Byrnes. A number entered the ward in the guise of visitors, overcame the RIC guards and seized the prisoner. Only one of the Volunteers was armed but, after a gun battle in which an RIC man was killed, they managed to get away with the prisoner. But Byrnes had been fatally wounded by one of the RIC men and he died within hours of being taken to a safe house. The British Army swamped Limerick for the republican funeral of Bobby Byrnes and on 9 April they proclaimed martial law in the city. The area proclaimed was the centre of the city where many working-class people lived. Every day, to go to and return from work in the city’s industries, they had to pass and pass again through military checkpoints and produce permits issued by the British Army. On 14 April, the Limerick Trades and Labour Council, representing 25 unions, called a complete general stoppage of work from that date. The call received the unanimous backing of the workers of Limerick and from 5am the city was at a standstill. For the rest of the month of April the Council effectively ran the city, granting special permits for essential workers, organising food supplies, issuing a daily newspaper and even producing its own currency notes. The spirit of the people was shown in many incidents, including the playing of an Easter hurling match on the north side of the Shannon, outside the cordon. Returning from the game, 300 citizens refused to produce their permits and defied the British Army by parading in a circle, held a midnight concert and entered the city next day by boat or train, avoiding the military cordon. Food for the city was sent in from the surrounding countryside, in some cases smuggled across the Shannon at night in boats with muffled oars. 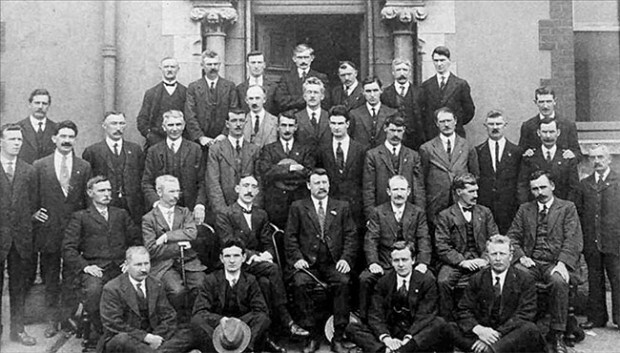 The strike had the backing of Sinn Féin, which controlled the City Council; the IRA, which helped organise the supplies; and the Irish Trade Union Congress and also the Labour Party. The Congress Executive met in Limerick and discussed calls to widen the action. But there were fears that a wider confrontation with the British Army – including a strike on the railways which would see their takeover by the military – would lead to armed conflict across the country. Armed conflict between the people, led by the IRA, and the British Army was coming anyway – indeed it had already begun – but the cautious trade union leadership stepped back and so the strike was confined to Limerick. Nonetheless, the workers had achieved a major success. They drew national and international attention to British tyranny in Ireland. The strike became known as the Limerick Soviet, after the workers’ councils or soviets in Russia, then at the height of its revolution. Forced by national and international opinion but above all by the solidarity of the workers of Limerick, the British ended martial law in the city at the start of May. The city of Limerick was in the hands of the workers in April 1919, 100 years ago this week.